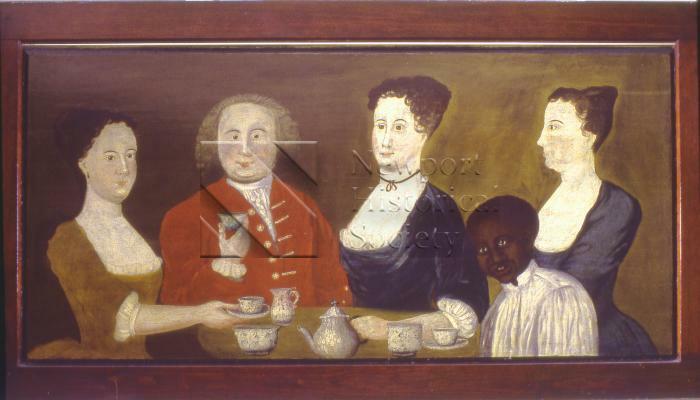 Portrait of John Potter (1716-1787) and his family including three women and a young black servant. Half length portraits of four main figures, who are grouped around an oval tea table with a blue and white porcelain tea set and a silver tea pot on it. Woman on left holds a cup and saucer. Man second from left holds cup, woman in center holds teapot; woman on right is in profile; others face forward. John Potter was a wealthy South Kingstown planter, notorious for his counterfeiting activities of 1742. This overmantel was removed from his home in Matunuck (home extant 1992).